An FA Cup Final programme dating back to 1910 has been sold for three times its expected price at auction. 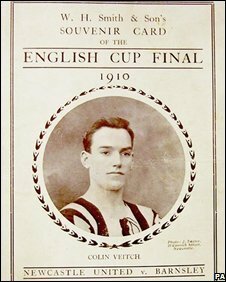 The W H Smith booklet was sold for just one penny at the 1910 cup final between Newcastle United and Barnsley. Keys Auctioneers, of Norfolk, said the owner did not realise he had the item until it fell out of an old book. The programme had been expected to fetch £1,000, but auctioneers said it was sold to a buyer from the Newcastle area for £3,000 on Friday. The programme previewed Newcastle's meeting with Barnsley at Crystal Palace on Saturday 23 April. The game was drawn 1-1 and Newcastle went on to win a replay 2-0 at Goodison Park on 28 April. Auctioneer Andrew Bullock said: "The amazing thing about this programme is its condition. "It was tucked inside a book published in 1906 and I wouldn't be surprised if it had not seen the light of day since the game was played almost 100 years ago. "Most old football programmes we see are in rather poor condition, but this one has nothing more than a slight crease - and the owner didn't even know he had it."